It’s officially 2017! River and I are currently on retreat at the Himalayan Institute, my yoga home. We have done a bunch here – hiked through the fresh snowfall, sipped hemp milk hot chocolate, and filmed a couple kid-friendly videos for YogaInternational.com. This is my 6th of 7 years coming to HI for New Year’s. It gives me a chance to reflect, reorient, rest and recover from the previous year. I always set intentions for the coming year, and sit for hours in the meditation shrine soaking up the good energy that so many souls have deposited there for rejuvenation, insight and support. There’s a pretty strong ParaYoga contingent here! 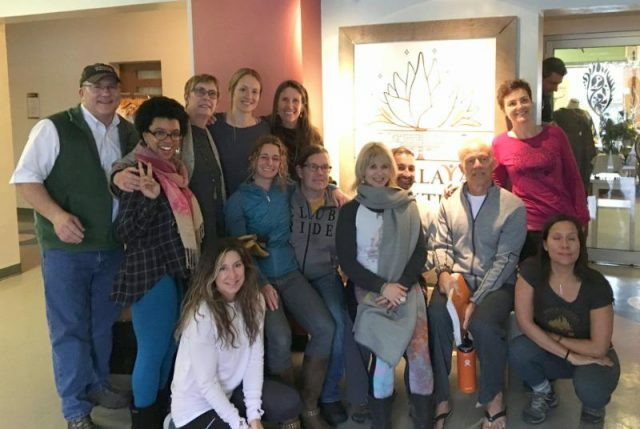 Fueled by purpose, we are learning the Sri Sukta (an ancient chant to celebrate the divinity in all things), and about to learn a whole new set of mantras called the Shiva Sankalpa Sukta. Wow! My practice has really amped up! If you are interested in learning the Sri Sukta, please contact me and we can start a study group!!! But it’s not all study and chanting out here either… we also participated in the Mannequin Challenge… coming soon to social media everywhere! I’ve had a pretty full 2016… so much teaching, lots of travel, my partner (The Fireman) and his teenage girls moved in, peaceful conflict resolution, my ex’s brewery was sold, plus I’ve had a miracle healing for my auto-immune issues. There’s been a “period” put the end of many stories in my life, and I’m so ever grateful to come out of this rajas (active) time with more clarity, patience, faith and gratitude than ever before. I feel clear on my path going forward, and can’t wait to share some of these gifts with you all.